I've heard an awful of hype about the Urban Decay setting sprays, mainly the 'All Nighter' version. It was a hot afternoon shopping at The Trafford Centre in Manchester that I wandered into Debenhams to peek at the Urban Decay stand. 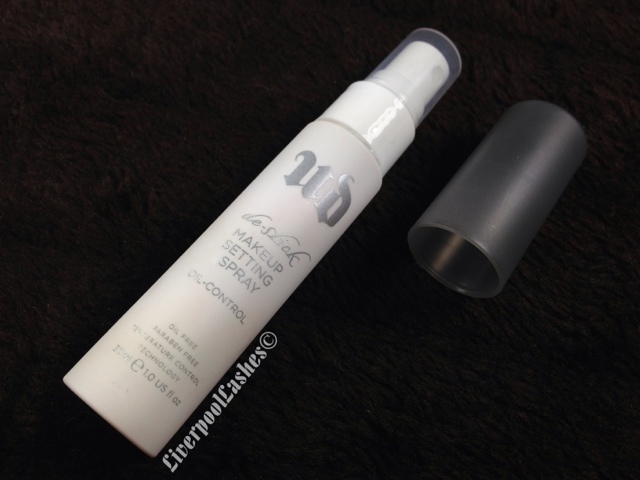 I was in the mood to try something new so I picked up Urban Decay De-Slick - Oil Control Make Up Setting Spray to try and rescue my make up throughout the summer months. The instructions on the bottom say to spray down the centre of your face and the across and finally diagonally. This spray has a slight fragrance, it's lightweight, refreshing when it's first sprayed and once it's dried you cannot feel it at all. This spray helps your make up not slide or fade. The bottom line is... This spray is brilliant. It would be great for someone that just needs a way of getting those extra few hours out of their make up. Have you tried the NYX Matte Finish Setting Spray? I picked it up and unsure. I have also heard great things about this as well.